Almost as though he had musician multiple-personality disorder (in a positive way), I was more than impressed with the different varieties and different “faces” of John Mayer. Was I listening to a heartbroken musician still carrying a torch for an old flame? Was I at a rock concert? It was all so different that I noticed the tone and mood amongst the audience members would shift based on the style that he was performing. 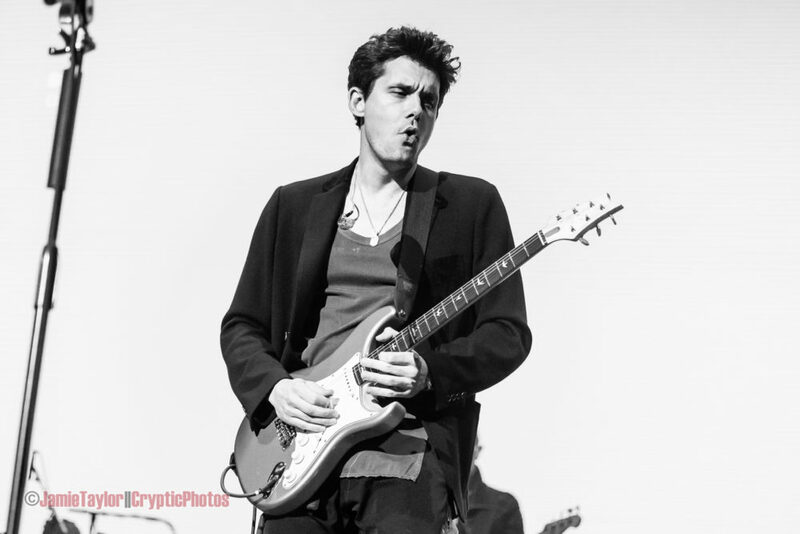 Some were enthusiastic overall while many decided to shy away from the rock version he became during the John Mayer Trio chapter. He went from solo acoustic guitar player to hard rocker and many other things all within a single show. The acoustic side was the original John Mayer version we all fell for in the beginning and playing with the full band brought out his rock, blues and even a bit of a reggae side. Apart from the different chapters that split up the evening, my favorite part of the show was the gorgeous 3D backdrops that appeared behind him as he performed. One was a cityscape skyline (I think it was Manhattan) another, a gorgeous Japanese garden with floating cherry blossoms and an L.A. style establishing shot filled with tall, skinny palm trees. The Japan projection flowed nicely as he took the stage to perform his first acoustic song as well as his cover of Tom Petty’s “Free Falling,” which he played very ‘a la John Mayer’ as he changed the style of the original and made it sound like his own masterpiece. His attitude seems to have changed immensely during the last few years and I think I underestimated him as an artist. Besides his amazing guitar-playing skills, I was never aware of the talent he was capable of. Although his ability and talent never really fell by the waist side, his reputation appeared to be outshining his music to degrees that made him lose the support and respect of some fans, myself included. Needless to say, he was redeemed in my eyes as an artist and like other worldwide tours, his had a very special sparkle of something.